Sappi North America, headquartered in Boston, is a market leader in converting wood fiber into superior products that customers demand worldwide. The success of our four diversified businesses – high quality Coated Printing Papers, Specialised Cellulose, Release Papers and Specialty Packaging – is driven by strong customer relationships, best-in-class people and advantaged assets, products and services. Our high quality Coated Printing Papers, including McCoy, Opus, Somerset and Flo, are the key platform for premium magazines, catalogs, books and high-end print advertising. We are a leading manufacturer of Specialised Cellulose used in a wide range of products, including textile fibers and household goods, and one of the world's leading suppliers of Release Papers with our Ultracast, PolyEX, Classics and Neoterix lines for the automotive, fashion and engineered films industries. Our Specialty Packaging products, such as LusterPrint and LusterCote, represent an important asset in the food packaging and labeling industries. 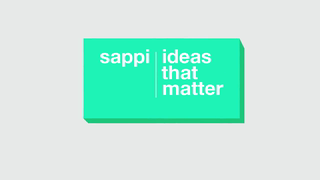 Customers rely on Sappi for high technical, operational and market expertise; products and services delivered with consistently high quality and reliability; and, state-of-the-art and cost-competitive assets and innovative spirit.